Use of Baggies -Yes or No? I open a new tin, I immediately put the tobak in a baggie, tighten it up, seal it (double seal, and either put it back in the tin or, if I'm storing it in quantity, , put it in a Ball jar and seal. Placing the tobacco in a double sealed baggie and returning it to the tin should help keep it from drying out for period longer than without the use of the baggie. For long term storage placing it into a Mason jar will keep it from drying out possibly for decades. Maybe the use of the baggie will extend this process even longer. I see no problems using the baggies. Others may have knowledge that I'm not aware of. No baggies unless I am out of jars. Either bail top jars for short term storage of tobacco I am currently smoking or Mason jars for everything else. When if comes to pipe tobacco I avoid plastic. No thanks in the jar for anything longer than a couple months. Dealing with food and storage, I've experienced plastic leeching flavors. Not only does it taste awful, it cannot be healthy. Contrary to some, I don't feel any need to compound unhealthy factors. Besides that, I don't understand the purpose of a baggy in a jar. Yeah, I guess that was the main impetus for (to?) this post: wondering about the leeching of plastic "tastes" and generally unhealthy things onto the tobacco over the long haul. Storing the tobacco in the baggie AND jar is just me being overly cautious/paranoid/OCD. So maybe I'll take the plunge and remove the baggies from the cellared tobak, store it "naked" in the jar and maybe invest in some of that parafilm from amazon.com mentioned on another post to insure a better seal. And yes, I will definitely continue to baggie up the stuff I'm smoking currently, even if currently means over the span of a year, in some cases. In others, well, let's just say it's a good thing they have a ZIPlock. As always, Many thanks for chiming in your well-earned opinions, brothers. I weigh them very seriously whenever a decision is to be made. I use canning jars exclusively. I don't use baggies for any long term storage. I've heard that baggies are somewhat porous. Why not use the baggies to put the tins in for short term instead of transferring the tobacco from the tin to the baggies? Why not use the baggies to put the tins in for short term instead of transferring the tobacco from the tin to the baggies? This is an astute point. That's definitely what I'd do if baggies were a necessary psychological part of my process. In other words, I'd find ways to eliminate the baggies while still providing that feeling of X, Y, and Z. I don't hate baggies, but I think there are better ways to achieve the same outcome. So, better is better. It's about retaining moisture, correct? There are a lot of other methods to help the tins. You could make a humidor for your tins. You could buy a vacuum sealer and seal the tins inside another enclosure, or enclosures, after each use. I used to have a nice Rubbermaid container with a make-shift humidor thingy I taped to the top. I'd keep my open tins in that thing. In the pipe shop I used to work, we allowed pipe smokers to keep their open tins in certain, better sealed lockers inside the walk-in humidor. Better options than baggies, but that is only my opinion. Keeping anything away from plastic is probably a good thing. I hope this doesn't all sound paranoid, but you asked. We answered. I drink out of plastic containers all the time, and I don't think twice. If I had a choice though, I never would. Good point(s) I had not thought of, but now seem obvious. Many Thanks! If I'm going to go through a tin in a week or two, I just tightly stretch plastic wrap over the top and put the lid back on. The plastic doesn't come in contact with the tobacco and it tightens up the lid. There ya go, straight from the blenders mouth. Take it as gospel. Ya, great idea. Never thought about that! I’ve put open and unopened tins in baggies. Did it make a difference? Yes, for opened tins. Don’t know for unopened tins. I’ve also wrapped tins in SaranWrap which seems to work just as well as baggies. I’ve also used repurposed vacuum-lidded glass jars to store tobak. Too often the seal rests being re-established, so I wrap these in Saran Wrap, too. (Caution: Don’t use a pickled beets jar for tobak storage. But Wheat Germ jars work dandy and re-establish a vacuum seal about half the time) Another way to store open and unopened tin is in those plastic containers used for sammiches and leftovers. There’s a round one that’s perfect for a 50 gram round tobacco tin. (I thought the name of these handy little containers would come to me, but no such luck.) No, I don’t wear a belt AND suspenders. Forgot to mention: look in your supermarket frozen health food section for Ezekiel muffins. (Made from a biblical recipe, they claim). They are packaged in a heavy plastic cover that is just the right size to repurpose to hold a stack of 50 g tobacco tins. At minimum it’s a good way to protect the tins and ease handling. I hate it when I try to pick up half a dozen tins at a time and end up dropping the slippery little rascals. This is a nice little hack for storing opened and unopened tins. Oh, and the Ezekiel muffins are good with a bit of peanut butter. Glad I don't have the problem you guys have! When I open a tin, I smoe from it till it's gone !! Loose 'baccy goes in mason jars and I smoe from them Easy peasy !! Oh, that’s way to easy a plan, as Tom Sawyer said in Huckleberry Finn. My problem was having maybe half a dozen plus tins or bulks available. So I needed some way to maintain and/or rehydrate. I normally have around 20 tins open at the same time. I leave the tobacco in the original tins and then store the tins in these plastic tupperware like containers I buy at Walmart. They come 4 different sizes to a package and costs only 6 bucks. They keep my tobacco fresh in the tin for more than 15 months. 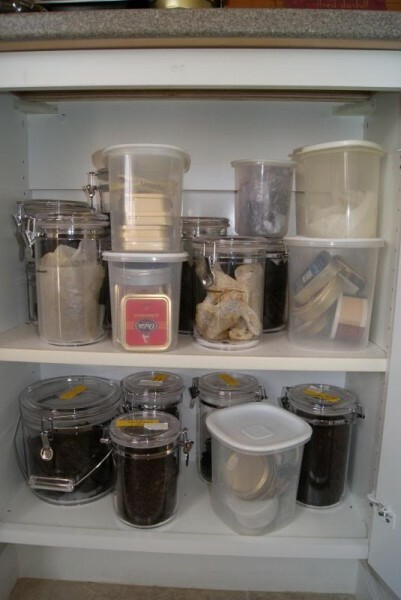 In the pic below, the containers I am talking about are the opaque ones with the white lids. It is so much easier throwing the tins in the tubs compared to jarring the stuff.